Salman Khan's bodyguard, Shera shares a post from the pre-wedding function calling the actor his 'maalik'. Actor Salman Khan recently attended the pre-wedding function of South actor Venkatesh Daggubati‘s daughter, Ashritha Daggubati, in Jaipur. Ashritha is getting married to her beau Vinayak Reddy and her pre-wedding ceremonies were only attended by close friends and family members. 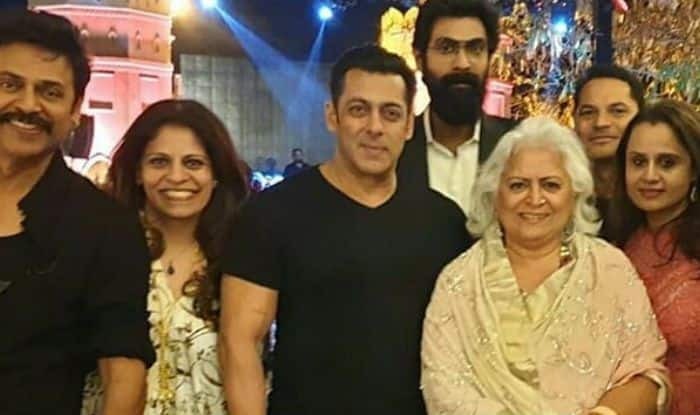 Salman, with his trusted bodyguard Shera, and veteran actress Bina Kak, was seen posing with actor Venkatesh and others at the pre-wedding function. The pictures of the superstar are surfacing on the internet. Also seen in the picture is Baahubali actor Rana Daggubati, who is also a relative of actor Venkatesh. While not much about the wedding is out in the media, a grand reception in Hyderabad is expected to happen after the wedding. Samantha Akkineni, Nagarjuna, Naga Chaitanya among others are expected to attend the function this weekend. On the work front, Salman Khan is gearing up for the release of Bharat, directed by Ali Abbas Zafar. The film is the big Eid release this year and features Katrina Kaif opposite him. It has Sunil Grover, Jackie Shroff, Disha Patani and Nora Fatehi among others in important roles. Salman has Dabangg 3 up his sleeve next. He also has Sanjay Leela Bhansali’s film titled Inshallah with Alia Bhatt after Dabangg 3. The announcement regarding the same was made recently and reportedly, it’s a love story set in abroad. Inshallah brings Salman and Bhansali back together after a hiatus of 20 years after Hum Dil De Chuke Sanam.